By Kelly Winters, Multimedia Journalist. U.S. President Donald Trump came to Grand Rapids Thursday, March 28 for his first campaign rally since the end of the Mueller probe into Russian collusion. His supporters gathered from all corners of Michigan to the Van Andel Arena to rally together and celebrate his presidency. After a warm welcome from his son Donald Trump Jr, the president made his grandiose appearance. Despite the spectacle that awaited people inside the arena, there were plenty of things to see before stepping foot inside. Protesters lined up by the dozens to object to the event in its entirety. After several inevitable fights and hours of waiting outside, the crowd shuffled into the arena. In addition to stating that he plans on running for re-election in 2020 with full anticipation of securing his second term, Trump also discussed several other issues that he is actively fighting for and against. One of the key topics Trump focused on that night was his disapproval of the Green New Deal, a stimulus program sponsored by U.S. representatives Alexandria Ocasio-Cortez (D-NY) and Ed Markey (D-MA) that aims to address economic inequality and climate change. Trump explained his view that this plan of action would be far worse than it seems, and that Americans are worth more than one car per household. With this, he also expressed his disapproval of the idea that gas prices need to be increased to collect money for the Green New Deal to be put into fruition. After this, Trump went on to explain more of what his administration plans to do in the coming weeks. Most of this pertains to the wall that he plans on putting along the southern border. He emphasized that he wants to enforce border security and repeatedly said that he will close the border if necessary. More than anything, Trump reiterated his stance that products need to be made in America by American citizens. He stated that over the course of his term, he has dropped unemployment rate to an all new low by creating more than 5 million American jobs. Unemployment currently stands at 3.8 percent as of Feb 2019 according to the Bureau of Labor Statistics. Trump further claimed that 60% of the new jobs are currently held by women. Despite giving his plan to address national issues, Trump assured the locals standing in front of him that he would look into issues affecting Michigan as well, promising to raise $300 million in funding for restoration and cleanup of the Great Lakes. This comes after the president proposed a $270 million budget cut from the Great Lakes Restoration Initiative earlier in March. Trump went on to talk about abortion and his disbelief in the Democratic stance in late term abortion. He highlighted his disgust with some U.S. state governors’ opinions on abortion. “In my state of the union address, I called up Congress to immediately pass legislation prohibiting the extreme late term abortion,” Trump said. Trump wrapped up his speech by recapping a few of his core beliefs such as the opposition toward “high taxes, open borders, late term abortion, crime, hoaxes and illusions.” He also claimed that he is working to make the most out of the American economy by pressing the “Buy American, hire American” motto. 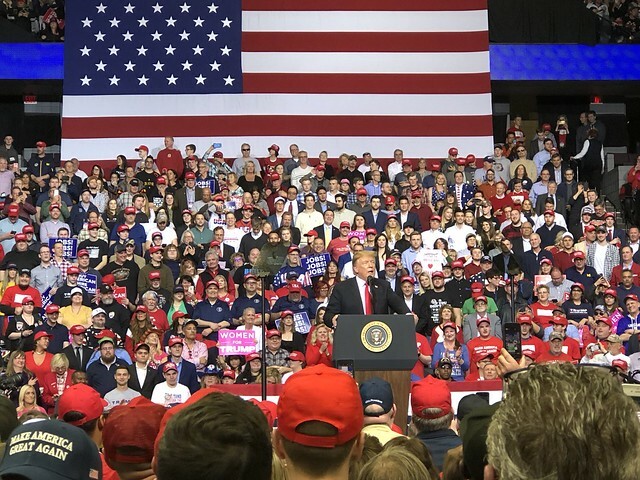 “With the very proud and very truly incredible and inspiring people of Michigan, we will make America wealthy again, we will make America strong again, we will make America safe again and we will make America great again,” said Trump, ending the rally with roaring applause.